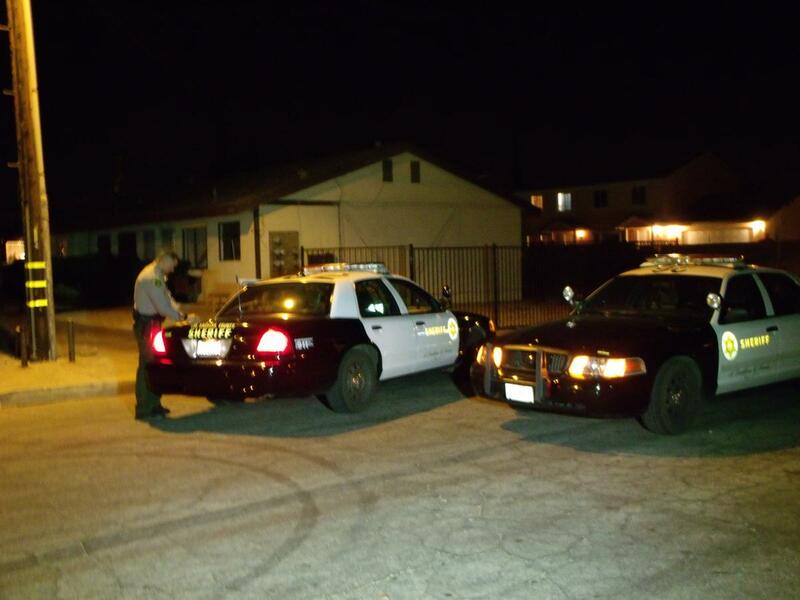 PALMDALE – Three shootings were reported in two areas of Palmdale Tuesday night. However, no one was seriously injured and no arrests have been made. The first incident occurred around 9:50 p.m. in the 38400 Block of Larkin Avenue, said Palmdale Community Relations Deputy Robbie Royster. Deputies, who were responding to the “shots fired” call, detained a vehicle that was coming from the location. A 20-year-old passenger in the vehicle was suffering from a gunshot wound, Royster said. Royster said deputies called an ambulance to transport the 20-year-old gunshot victim the rest of the way to the hospital, and deputies continued their investigation. By the time deputies went to the hospital to interview the man, he had already left, Royster said. “In between this gentleman’s treatment, he told the hospital staff that he didn’t want to do it anymore, he’s done,” Royster said, adding that the man checked himself out of the hospital as he was awaiting X-rays. The other two shootings happened at 10 p.m. and at 11:30 p.m. Both shootings occurred in the 38500 Block of 10th Place East, Royster said. At 10 p.m. an informant called the Palmdale Station to report that two shots were fired. “When deputies responded our aero was overhead and identified an individual running from that general area down an alleyway trying to evade the helicopter,” Royster said. The man was detained but later determined not to be involved in the shooting. Deputies were unable to identify a suspect or a victim related to the shots fire call. At 11:30 p.m. another call came in reporting that seven or eight shots were fired from the same location in the 38500 Block of 10th Place East, Royster said. An informant told deputies he saw two men arguing and then one of the men pulled out a gun and fired at the other man. Responding deputies recovered several shell casings from the area, Royster said. “There were shell casings from multiple different calibers which would mean different guns,” Royster said. He said deputies were unable to locate the victim or the suspect in the incident. There were no reports from local hospitals indicating a gunshot victim had checked in, Royster said. “Just because of the nature of the circumstances surrounding the shooting, we do believe that it’s probably gang related, however we can’t confirm that it is,” Royster said. The informant described the shooter as a black male, between 25-35 years old, about 5 feet 8 inches tall and weighing about 200 pounds. Anyone with information on any of the three shootings is encouraged to contact the Palmdale Station at 661-272-2400. If you would like to provide information anonymously, you can do so by calling Crimestoppers at 800-222-8477. 14 comments for "Three shootings in Palmdale Tuesday night"
The more Blacks you have in your city, the worse it gets. There is NO city in the USA with a high Black population that is nice, low crime and prosper. I am not a racist, I am realistic. Since when did it become appropriated to use Ebonics in a public chat forum? Maybe it became ok, when the spelling of “concerned” became “Concered”? Just sayin’. I wish there were 2 planets, one for the good people, the other for the bad people. I’m from the old school Venice. I’ve been robbed and assaulted 8 times. Instead of letting it kill me inside… it made me stronger and given me a good heart, and not to forget I’ve lived my life just inches away from homelessness. So people out there our choices make us who we are. We are responsible for ruining our own lives. Be good, stay safe, God Bless. The liberals would never let you get away with that! One planet would have more wealth, happiness and peace than the other and the liberals would say that things are “unequal”. They would also say that people on the Good Planet are “privileged” and people on the Bad Planet are “deprived through no choice of their own”. Then the liberals would say that in order to compensate for the wealth, happiness and peace of the Good Planet, it “must share in its resources” with the Bad Planet and allow a certain percentage of people on the Bad Planet to move over to the Good one. Then, the liberals would tell people on the Good Planet not to try to change the manners of the people from the Bad Planet because it would go against the “enriching diversity” the people from the Bad Planet would bring to the Good one. If people from the Good Planet notice that their planet is changing for the worse and wish to do something about it, the liberals will block their every move and accuse people on the Good Planet of “planetary racism”. Soon, the liberals will argue that even more people from the Bad Planet should be brought over to the Good one in the name of “planetary social justice”. Then, when the Good Planet has been thoroughly destroyed and ruined by the people who moved there from the Bad Planet, the liberals will proclaim that everything is well and good and there is “equality” between both planets. Maybe you fully didn’t understand, but well written. I’m talking about murderers, child molesters, rapers, robbers violent crime offenders etc. They do have a choice, nobody put a gun to their head and made him/her commit their act of violence. So a planet for criminal, a planet for law abiding citizens. race, color, gender, age, and bank account has nothing to do with it. A rich but evil person would be on the planet he chooses by committing crimes…the bad evil people planet, regardless of race, color, gender, age and financial status. There is nothing to argue, 2 planets would never happen any how. Just a wish that people can live in harmony. Be safe, God Bless. Rush?!? Is that you?? I hope that’s your opening monologue Monday morning! I’ll be listening intently! Beautiful .. Typical night in Palmton (Palmdale/Compton). So sad. Trying to talk down on people with incorrect grammar. It’s spelling (and punctuation, and capitalization), not grammar. If you want to be the linguistic police, then you need to get your linguistic constructs right.